The red carpet was the hallway at the global law firm Dewey & LeBoeuf. The fashion statements were more sassy than flashy. The opening video took the night’s first award. The special celebrity guests included a glowing team of Bpeace’s Fast Runners from Afghanistan led by our country director Soraya Omar. Oscar can’t compete with VERA for heart, soul, and authentic smiles. 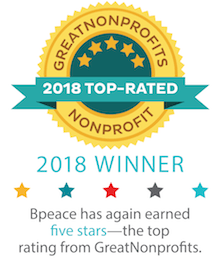 VERAs (Volunteer Excellence Recognition Awards) are Bpeace’s annual tributes to our most outstanding members. 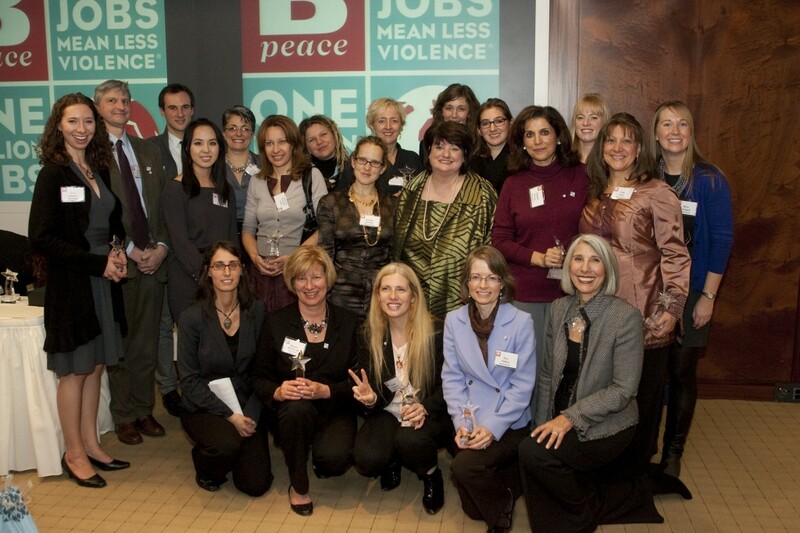 They were presented at the Bpeace annual meeting in November. The Bpeace ECONOMIC IMPACT AWARD went to 1st Avenue Machine for the One Million Jobs video. Three creative Bpeacers were responsible for providing guidance that led to that amazing video. Our BIG IDEA VERA went to: Cheri Anderson, Allie Bartolino, and Mara Grbenick. A Bpeace ECONOMIC IMPACT AWARD went also to Blue Marble Ice Cream and Alexis Miesen and Jennie Dundas. For two years they stretched their expertise 5,000 miles to Butare, Rwanda, determined to provide a local women’s drumming circle with steady jobs to change their lives. We were honored when Alexis and Jennie asked Bpeace to share a bit of this dream and provide training to the shop’s workers who will one day be its owners. As a result, Fran Pastore won a TRAINER OF THE YEAR VERA for her work with Sweet Dreams in Rwanda. Among VERA winners, there is a rare designation—EXTREME BPEACERS. These are members are juggle many Bpeace projects in a single year. Not only did our EXTREME BPEACER Donna Fleetwood deliver customer service training in Rwanda, she also traveled to DC with us to raise awareness; hosted a THREAD screening and raised a lot of money; is an Advocate for Latifa in Afghanistan, and recruited a bunch of new members with more on the way. Another EXTREME BPEACER has traveled with us several times to Afghanistan, Dubai, and helped visiting Afghans understand what they are learning at dairy farms and shoe factories. With a PhD in Organizational Psychology, an EXTREME BPEACER VERA went to Khatera Sahibzada who provides Marla and Toni with coaching as they manage this complex organization. A third EXTREME BPEACER award went to Aliana Pineiro, for juggling fundraising, the new-member welcome team, the third-country-exploration team and the Young Professionals. And by the way, Aliana coined the term—EXTREME BPEACER. The RACE TO INNOVATION gave Bpeacers the opportunity to excel. Teri Leavens--became the Advocate for Herve—a young man who is launching a fresh food delivery service that employs women--to bring food to working women. David Derrick deployed his skill as a highly creative and insightful architect, to deliver detailed technical advice to a young man shaping fiberglass dome homes in Afghanistan. Jayne Cravens advised an Afghan man how to start a much-needed commercial cleaning service in Afghanistan before he decided to take a different route. Bpeace has wanted to extend beyond Afghanistan and Rwanda for a while. Our first-ever EXPLORER VERAs went to Lisa Dubin, Monica Hinojos, Peri Winkle Soldati and Carole Vaporean. Janice Pedley who applied her graphic design skills to everything from food labels in Afghanistan to Bpeace postcards. Gita Patel who leveraged her network to fundraise and mined her Thunderbird alumni network to help us expand into El Salvador. Mojdeh Barros who is the Advocate for two of our Afghan Fast Runners. Johnna Hobgood for helping her Afghan Fast Runner Maryam, launch an Internet Café for women.